Here are the details about the Shwetark Ganpati. You can now know about what experts say or our pauraanic granthas say about this miraculous product. Shwetark Ganapati is procured from the root of a flowering shrub that takes the form of Lord Ganesha when carved out of its root, which itself is used as the most sacred and purest form of Shvetark or Aark ki Jad. It is also known as aak or ark ki jar, which is said to have blue and green colored leaves and is found in deep jungles, in mid of Madhya Pradesh. The possessors of this carved ganpati or the shwetark ganpati in its original root form are blessed with immense wealth and remains free from all evil effects. The root of this white Aark plant must be taken out very carefully and when the thin wood cover over the shwetark root is peeled-off, one will see an image or a shape of Ganpati beneath the plant. For doing puja, saadhna and some also practice and do tantric vidhi and tantra saadhna, this root in its purest form is used for the best results. 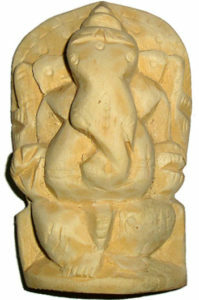 But giving devotion to lord ganesha, it is also carved in its ganpati form and used accordingly. Spiritual connect and lords blessings are attained by worshipping this shvetark ganpati.